I love you messages for ex-wife: Getting divorced is a classic example of how life can sometimes take the ugliest of turns. Husbands and wives fall out over the silliest of problems which eventually snowball into irreconcilable differences. Couples often regret leaving their life partners but sometimes it is just too late to try and mend things with an ex. If you haven’t been able to come to terms with being separated from your wife and still want her back, a sweet message may be on the cards. 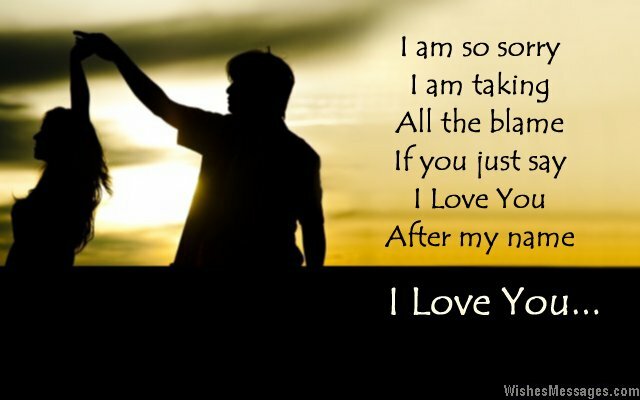 Take ideas from these heartbreaking quotes if you are finding it difficult to convey the sad feelings of your heart. Get a grip over your emotions and do it only if you see a strong chance of getting back together or else it will create more complications. 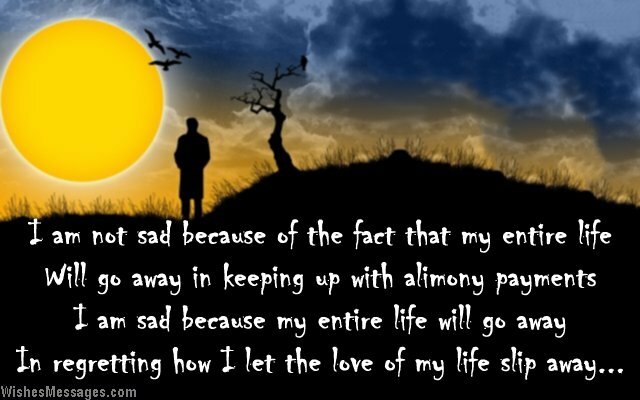 1) I am not sad because of the fact that my entire life will go away in keeping up with alimony payments. I am sad because my entire life will go away in regretting how I let the love of my life slip away. I love you. 2) A broken home, failed marriage, splintered family, battered heart – what is it about you that I love even after you gave me all this? 3) A court may have the power to end our marriage, but it does not have the power to end my love for you. I love you. 4) I have a love-hate relationship with our divorce because I lost a lovely wife to it, but gained an amazing friend from it. I still love you. 5) Love while dating, hate during marriage, love again after divorce – as they say, life always comes a full circle. I love you. 6) I have tried to hate you but I have miserably failed. I have tried to stop loving you but I have failed in that too. I love you. 7) Such is life, that we got married and I began hating you. Such is life, that we got divorced and I started loving you all over again. I love you. 8) How ironic is the fact that my love for you started ripening when our marriage began going sour. I love you. 9) There was a time when I loved you for what you couldn’t be for me. There was a time when I loved you for what you were to me. But this is the time that I love you for what you will always be to me. I love you. 10) I regret that it took a divorce to make me realize how madly I am in love with you, and will always be. 11) One flimsy divorce paper doesn’t have the power to destroy the love I have for you in my heart. I love you. 12) Our divorce may have been the best thing to happen to you, but you were the best thing that happened to me. I love you. 13) Nothing between us can ever be right again, except for the fact that I love you even more than before. 14) People realize the real value of their loved ones when they lose them. I have just realized that you are priceless. I love you. 15) My marriage to you has been annulled, but my love for you can never be. I love you. 16) Marriage is supposed to bring two hearts together, but in our case we drifted apart. 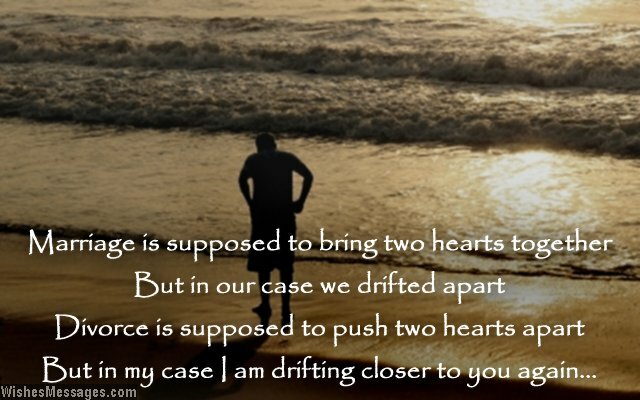 Divorce is supposed to push two hearts apart, but in my case I am drifting closer to you again. I love you. 17) Our divorce may be destiny’s way to tell us that maybe it is best if our love for each other grows outside the confines of marriage. I love you. 18) Since I haven’t been the perfect husband, the least I can do is to be a perfect ex-husband by remembering and cherishing every single moment I have spent with you. I love you. 19) My marriage with you was like a first timer’s experience with wine – by the time a taste for it was cultivated, the bottle got over. I love you. 20) Our marriage wasn’t strong enough to survive the storms of time, but my love for you will always be. I love you. 21) Just like how the shine of a diamond doesn’t fade whether someone wears it or not, my love for you won’t diminish whether we are married or not. I love you. 22) When I rewind my life in my head, I think of happy memories with you. But when I fast forward, I become blank. Please come back in my life and so that I can hit play again. I love you. 23) I will stop calling you my wife, but my heart will never be able to stop calling you my love. I love you. 24) I have moved on from our failed marriage. I have moved on from our messy divorce. I have moved on to accept that I am a single dad. But I don’t think I will ever be able to move on from loving you. I love you. 25) I am ready to say sorry, I am ready to take the blame. I am ready to do everything as long as you say I Love You after my name. I love you. 26) I have never dreamt about time machines as a young boy as much as I am dreaming about them right now – to go back in time and set things right with you. I love you. 27) How odd is it that even though we live far apart, I feel closer to you more than ever? Maybe it’s because I have now realized that my love for you will last forever. I love you. 28) The irony of my life is that I loved you when I made you my wife. But I love you even more, now that you are my ex-wife. 29) It would have been better if you took away everything I owned after our divorce – but you only chose to take my heart with you. I love you. 30) From cars to holidays to promotions, we wasted our marriage chasing the wrong dreams. We should have remembered that once upon a time, the only dream we had was to be with each other forever. I still love you. 31) Getting back together with my ex-wife is not possible because my heart hasn’t let go of her in the first place. I love you. 32) Darling, sweetheart, honey and baby are the words I have permanently deleted from my dictionary because they were meant exclusively for you. I love you. 33) Even tears become pearls when they come out of my eyes because of you – that’s how precious you are to me. I love you. 34) You still make my heart flutter, give me butterflies in my stomach and make my knees wobbly. Maybe I have fallen in love with you once again after our divorce. 35) You are like my football jersey from high school – I may have outgrown it, but I can never get over it. I love you.